A few weeks ago, Leonardo da Vinci's "Salvator Mundi" painting sold for a record $450 million dollars. The sale of this Da Vinci painting was the talk of the art world, but the sticker price was definitely a conversation topic for weeks after. So, what was so incredibly special about this single panel (damaged) painting that earned it the title of the highest price paid at an auction? The answer could be any number of reasons. Perhaps one was that the buyer, Saudi Arabian prince Bader bin Abdullah, was an ardent Leonardo da Vinci fan effectively swept away by the marketing campaign by Droga5 that referred to the painting as "the male 'Mona Lisa'", thus cashing in on the emotional connection of one of the most iconic art pieces in the world. As you have garnered by now, I'm obsessed with art. A self-professed art-a-holic, I have never miss an opportunity to head to an art gallery in a city. My travels have taken me as far as the The Art Institute of Chicago, The Metropolitan Museum Of Art (New York) and The Louvre (where I did actually see the Mona Lisa up close and personal), and as local as the AGO, where I love to hang out any chance I get. Art is creatively inspiring for me. So, when I came across a gem of a book by Dundurn Press, I was absolutely floored. 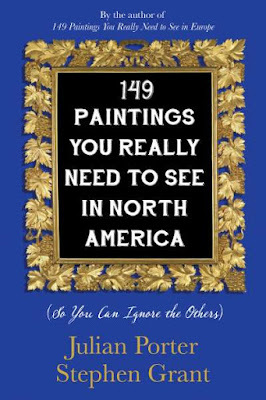 149 Paintings You Really Need To See In North America (So You Can Ignore the Others) by Julian Porter and Stephen Grant, is a great companion for quick insights into some of the world's greatest paintings. Porter is a noted litigation lawyer whose previous foray into the realm of artistic criticism was similarly and cheekily titled 149 Paintings Your Really Need To See in Europe (So You Can Ignore the Others). Sukasastyle review here. Grant is also a lawyer, practising in Toronto, who especially loves the twentieth-century modernists. I reviewed the previous book and excited about this North American version. 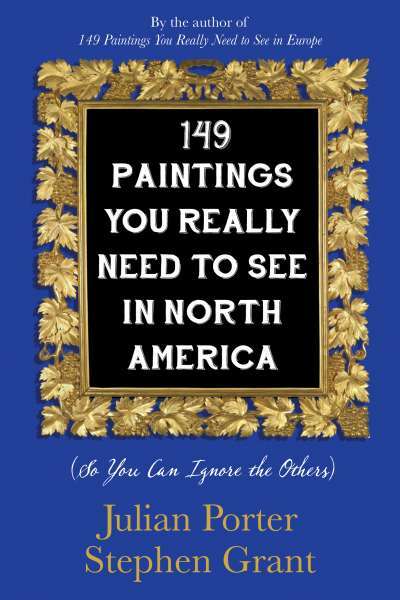 "149 Paintings You Really Need To See In North America" is an easy read; it is easy to follow along and thus ensures that the reader would be able to spot the recommended paintings whilst visiting a city. For example, in Detroit, Michigan, I'd have to check out Pieter Bruegel the Elder's The Wedding Dance (1566) at the Detroit Institute of Arts Museum. The painting is a part of a trilogy on marriage and partying. The bride, with a frizzy mop of hair appears in it. It seems that at that period in time, dancing was viewed by the church and authorities as a vice. There's a lot going on in this painting...a slobbery kiss before a viewer (the identity to be determined)? There's a party going on alright...and it's out of control. There's a lot of literature that's out there to potentially help an art lover aspiring to be more knowledgeable. But it isn't necessarily accessible; it's either dry, or academic, at one end of the spectrum; or dumbed down and superficial at the other end. This book is neither. "149 Paintings You Really Need To See In North America" has wit, a critical eye, attitude, and an endearing need to inform without talking down or flummoxing its audience. It's still nice to be able to hold a well-made, sturdy paperback, with archival quality paper that'll make you smarter and better informed about great art in unexpected places.